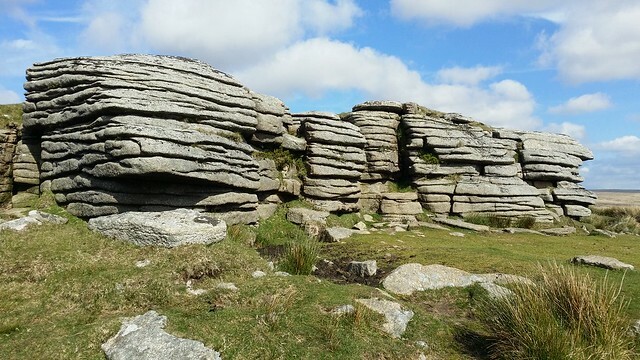 East Hill was a riot of purple and yellow as I climbed up and contoured around to find the first tor of the day – Ashbury Tor. I managed to overshoot it and doubled back through the gorse fringing the edge of the hill to find it. Unsure at first, I managed to find a spot that matched the photo on my laminate for that tor, and was satisfied. 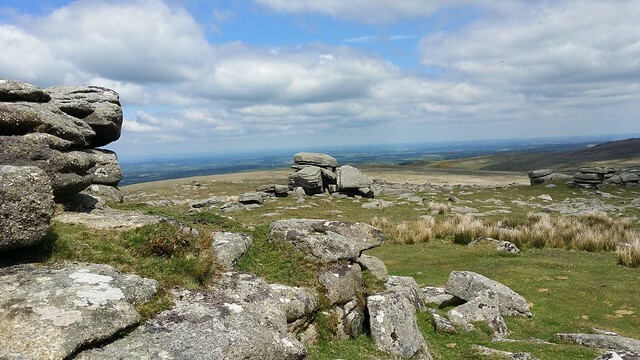 Onto the next point – East Hill – no tor here, and consequently @DaylightGambler has moved it off the Social Hiking tors list to the less glamorous Hills of Dartmoor list. 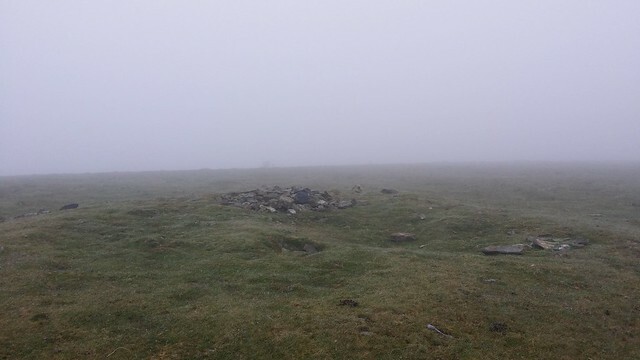 It did at least have a trig point and some other lumps of stone to decorate the lofty summit. 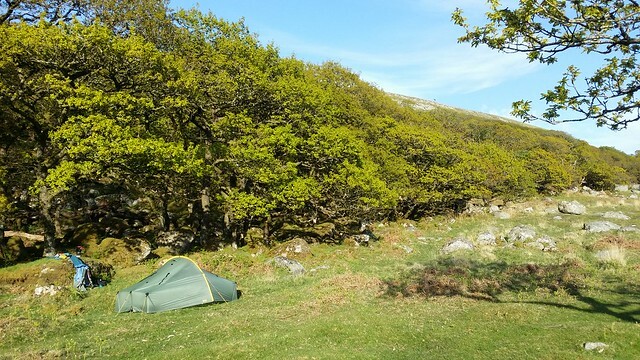 I dropped back down to the road that leads to Okehampton Camp and followed it past the camp onto the moor proper, leaving it to cut across the rough grasses to head straight up Rowtor. 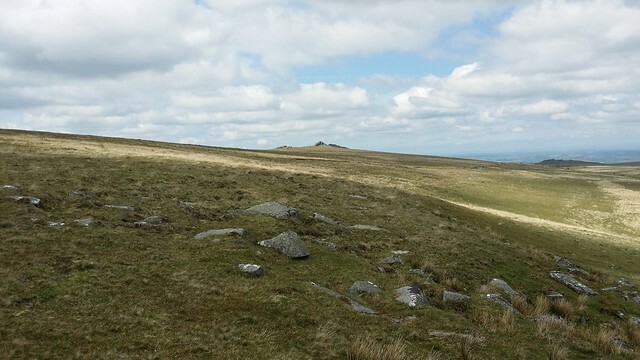 In the distance beyond I could see West Mill Tor and the end of Yes Tor. 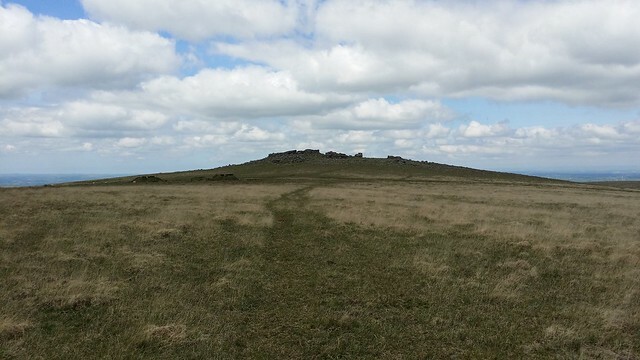 I reached the top, had a brief pause and began the trudge along to Curtery Clitters, initially heading through the firing range making for a boundary stone close to where the name (picked out in the blue of a water feature bizarrely) is shown on the OS map. 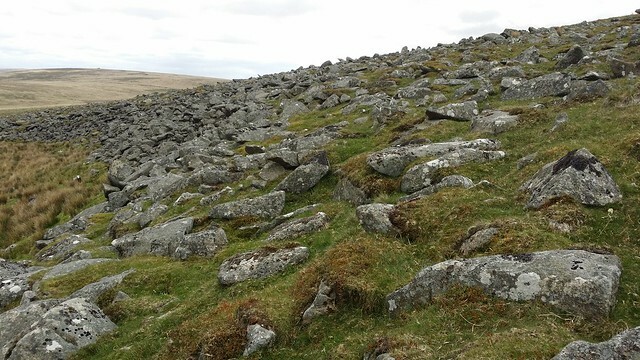 This wasn’t it though, and there was no doubt – ahead on the hillside was a large expanse of stone blocks. I made my way along and picked a route through the clitter and then climbed up to the observation post and boundary stone. 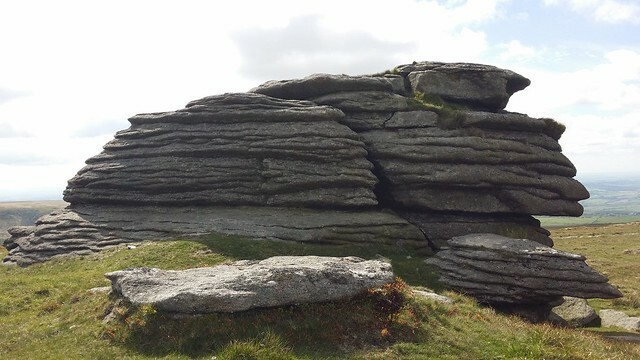 And now the zigzag part of today’s walk began as I recovered a big chunk of the northerly distance I’d just surrendered on the climb up to West Mill Tor. And here disaster very nearly struck. 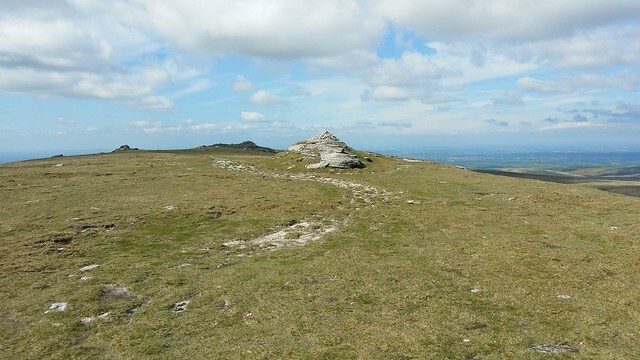 I clambered up to the top of the tor and somehow stumbled between two lumps of granite, wrenching my ankle painfully. Several minutes stop and lots of rubbing were needed before I tried putting weight on it. It wasn’t too bad for walking on, but a shaft of pain shot up through my right leg every time I lurched into a dip. 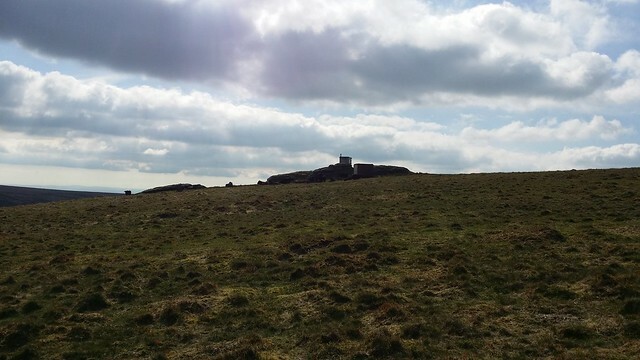 My right foot didn’t stop me getting to the top of Yes Tor, although it did slow me down a bit. 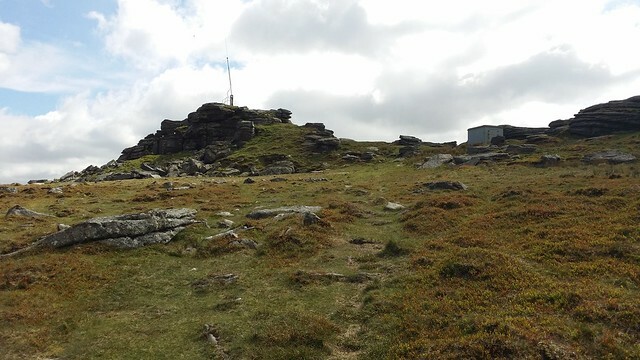 It was an easy matter to continue along the plateau to Hampster Tor and High Willhays, where I ceremonially made myself the highest person in southern England for a minute or so. 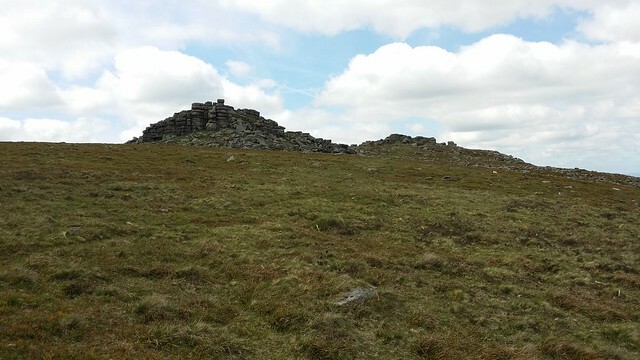 South and down over the grass to Dinger Tor next, according to legend the home of the giant Blunderbus (amongst other names) who had four wives, of which his favourite Jenny was the youngest, and in good legend fashion was scorned and spurned by the other three miserable old crones. They drove her out by the simple expedient of making life hell for Blunderbus until he ditched her. She ran away, happened across a load of Cornish wreckers in the process of luring a ship ashore and prevented the tragedy. The ship’s captain gave her the recipe for clotted cream as a result and she got “reinstated” by feeding Blunderbus lots of cream teas. Gets my vote. This was all well and good, but at Dinger Tor there was neither (a) a family of giants, nor (b) a comely wench serving cream teas. All that was there were some rocks and the end of a track. 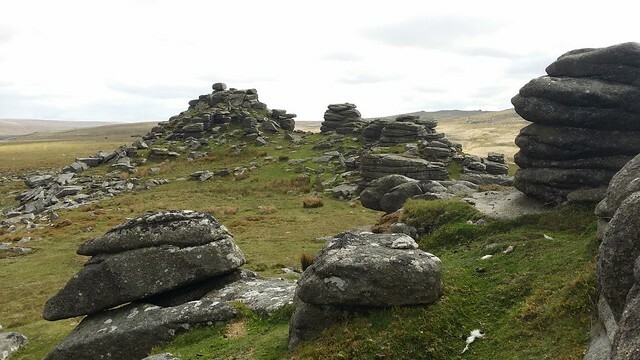 And a view down to Lints Tor which I used my foot as an excuse to not bother with. Back up the hillside partway and around to Fordsland Ledge, I had to weave my way around a group of bovine statues to claim the penultimate tor of the day. 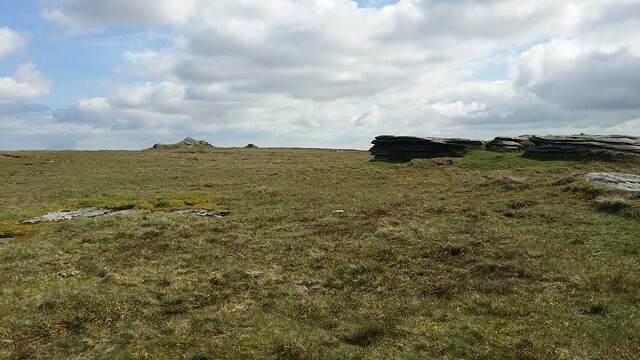 Ahead the three big outcrops of Black Tor lay and just below was camp. With progress having slowed markedly due to hurty foot, I was keen to stop for the day, so pushed on to the tor and then down the hillside to Black-a-Tor Copse, clambering over the clitter to head a little way upstream of the West Okement for a more discreet pitch. There were still people making their way off the moor, I could see them through the trees, so I put off pitching for a while, and had a (regrettably scone and cream-free) afternoon tea. A bunch of delinquent sheep blew through the site and I snarled threats at any that looked like having a poo on the patch I’d earmarked for Monica for the night. They eventually went on their way, and I got pitched. It was a painful night in the tent as my injury made sitting uncomfortable when it put any pressure on the afflicted area, and it was a bit of a relief to get to bed. I could have been forgiven for thinking I’d woken up several days later, so stark was the contrast with last night. 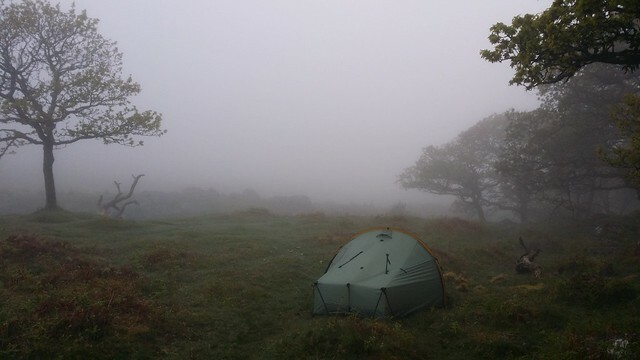 A shroud of white surrounded the tent, and moreover it was a really damp mist. 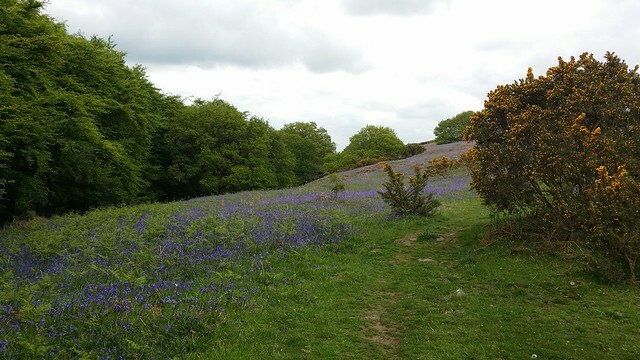 Having woken with my foot still hurting, I was now worried that my planned week of walking the SWCP in a few days time was now in serious jeopardy. 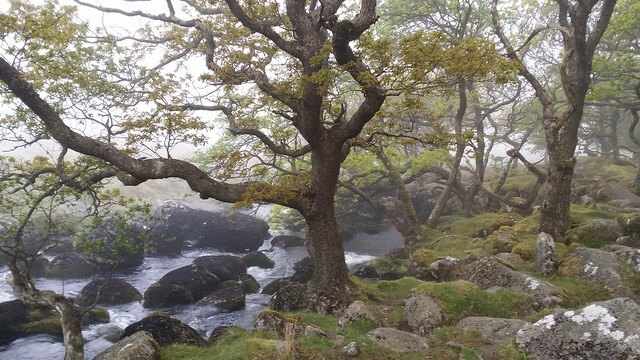 I packed up and made my way back downstream and through the edge of the copse to begin the climb up through the fog onto Longstone Hill and the descent back to the car. 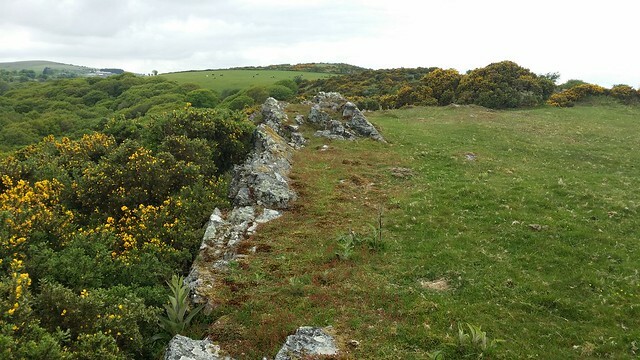 A fair bit of compass- and GPS-checking was the order of the day here, but eventually I found myself on the ridge and heading down towards Meldon. Injuries on a walk always put a damper on things, but at least you still managed to carry on. I’m amazed at how differrent the copse looks now that it has leaves – I visited about a month earlier and it had looked pretty spooky with its leafless trees. Previous Previous post: What Do I Do Now ?